Some interesting findings reported over on Cliff Atkinson's Beyond Bullets blog (a great read in general for anyone interested in creating better presentations, by the way): Presentations with complete sentence headlines for titles rather than a traditional brief heading appear to increase comprehension of the presentation. Does it really matter what you put at the top of your PowerPoint slides? Absolutely, according to researcher Michael Alley, who tested two designs for teaching slides on two groups of students -- one design with the conventional category heading at the top, and another with a complete sentence headline at the top. The result? 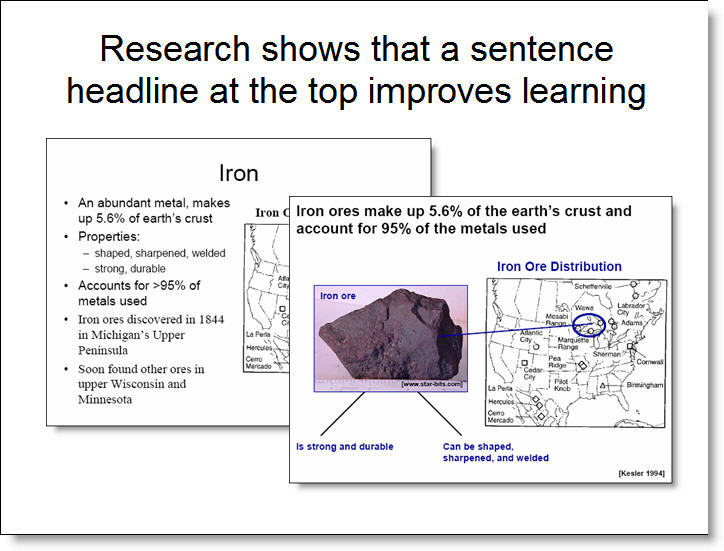 A significant improvement in test scores among students who saw the slides with complete sentence headlines.